To order any items (except the Holiday Greeting), contact Patsy Nielsen at patalex@twc.com or 859-278-2178 or contact the Alumni Office at alumni@transy.edu. 100% Pashmina scarves in a variety of colors embroidered with "TU." These shirts are long-sleeved and in a variety of colors. The front has our beloved Pioneer in crimson and the back sports a screen-printed photo of Old Morrison. These lightweight shirts are available in short sleeve and long sleeve. Colors available are royal blue, black, aqua, and crimson. Small baby bib just the right size for a newborn. Full apron perfect for protecting against spills in the kitchen or outside on the grill; crimson with TU embroidered in white and great for both men and women. Choose between 2 or 3 pockets. These Transylvania crimson bags with white logo are large enough to hold all your essentials. Choices include a tote with double handles or a darker crimson book bag with drawstring opening. These tote bags are a great way to show your love for your favorite sorority and come in a variety of colors. Each blank greeting card is individualized with a beautiful photograph taken by Patsy Nielsen '61. Handmade and hand-painted reproduction of Old Morrison made exclusively for the Transylvania Women's Club. 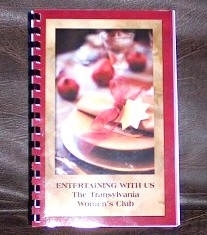 This book includes party themes, menus, recipes, ideas for decorations, and table decor. Keep warm this winter with this knit cap in a variety of colors. Perfect for watching the student athletes compete on the new Athletics Field. Available in black only. This heavy cotton bucket hat is useful and attractive. Colors available are red, black and khaki. A special holiday card created especially for the Club and a god way to send your best wishes to all Transylvania faculty and staff. For a small donation of any amount, your name, and those of your family members if desired, will be listed on the card. Order forms are sent in November. To be listed, contact Olesja Cormney at olukjanova@yahoo.com or 859-619-5199.